To impact our community by implementing sustainable solutions…building a better way to live. Integrity: Using best practices and best products. Using building performance certification to evaluate projects. Continuously doing the right thing, especially when no one is watching. Standing behind our workmanship. Craftsmanship: Having an attitude of excellence. Exceeding state code and typical structural and energy requirements. Striving to be leaders in our industry with innovative developments and trade practices. Relationships: Caring for and respecting our employees. Going the extra mile, especially amidst any challenges we face, in order to care for our customers. Partnering with professional subcontractors committed to our values. Creativity: Providing unique and thoughtful solutions to homeowners. Helping them to design better living spaces which they can enjoy well into the future. Acknowledging that everyone has a budget and finding the balance between design and cost. Stewardship: Caring for people by being involved in strategic community projects that impact Minnesota. Preserving our environment by implementing the use of sustainable resources in our projects and providing efficient engineering and design. Morr Construction is part of the pioneering community for the advancement of green building in the state of Minnesota. We built the first LEED silver certified home in Minnesota and have participated in the MN GreenStar remodeling and new construction certification programs. We believe it is important to continue to incorporate MN GreenStar and LEED certification into our projects. We are enthusiastic about contributing to the catalyst for the green building tipping point in Minnesota and Wisconsin. Passive House in the Woods is a new challenge for us, as it is our first opportunity to construct a certified passive house. As the first passive house to be built in the Twin Cities and the state of Wisconsin, we are excited and honored to be part of this innovative project. As the general contractor, we work closely with the architect and homeowner, offering practical advice based on our knowledge and experience by doing cost estimating and value engineering. We also coordinate with all subcontractors to ensure that they fully understand the conditions and expectations they will be working under. 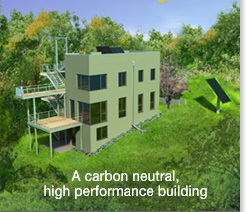 In addition to passive house certification, Passive House in the Woods will also be earning MN GreenStar certification. We will provide all documentation to assure that the certification requirements are met. The knowledge and skills we gain from constructing Passive House in the Woods will be applied to the upcoming construction of the Appleseed House as part of the MinneAppleseed Collaboration.